Home prices are attractive and there are many homes available for sale. Offers an enriching lifestyle in the heart of Arizona's rugged splendor. You'll love the sunshine, mild winters and all the history and activities Yuma offers. 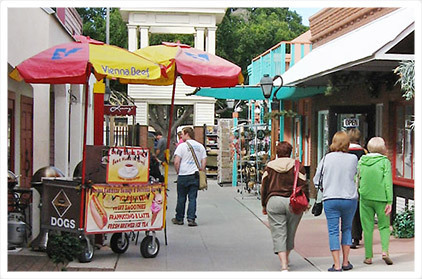 You can enjoy Yuma Palms Shopping Mall, Lutes Casino in Historic Downtown and the many other attractions in Yuma Arizona. If you're in the mood to explore the natural beauty of the region, you won't want to miss the Castle Dome and Palm Canyon, both just a short drive away. Located in the Southwest corner of Arizona, Yuma neighbors Mexico and California bordered by the Colorado River. More than 200,000 people live year-round in Yuma County and over 83,000 Winter Visitors make Yuma their winter home. Yuma's economy is fueled by Agriculture, Military and Tourism. Yuma's climate allows for a year-round growing season for crops such as lettuce, cotton, wheat and hundreds of other crops. Two military bases, Yuma Proving Grounds and MCAS Yuma, are located in Yuma County. Tourism thrives in Yuma; not only with the Winter Visitors, but also visitors to play in the River & Sand Dunes. Yuma is noted in the Guiness Book of World Records for being the Sunniest Place on Earth. Outdoor activities are plentiful and range from boating, off-road adventures, hunting and fishing and golf. Many tourists travel to Los Algodones, Mexico or San Luis Rio Colorado Mexico to eat, drink and shop. Some must-see places to visit are the Yuma Territorial Prison and Lutes Casino.